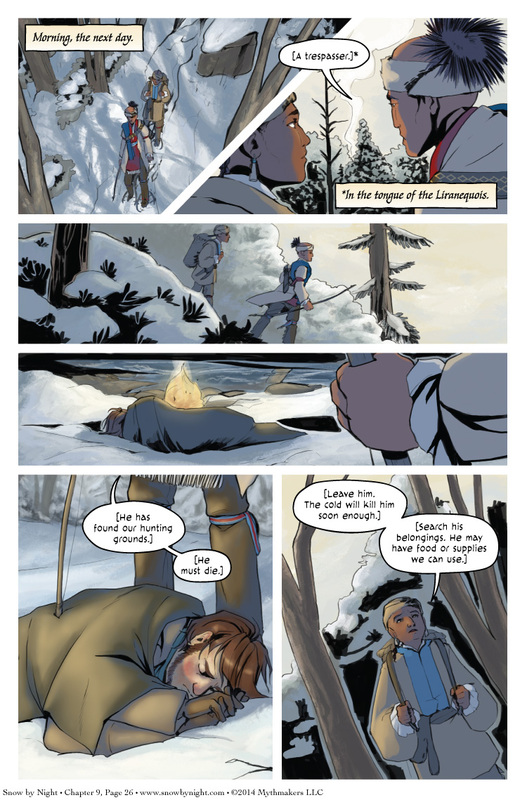 A hard-earned morning comes for Blaise on Chapter 9 Page 26 as do some other travelers in the woods. This group has been waiting backstage for 9 chapters now and it is time for them to come onto the center stage of our tale of colonial fantasy. To see what the Liranequois do next, please vote for Snow by Night on Top Web Comics. We’re almost to the ned of this chapter. The coming vignette is illustrated by our gloriously talented colorist Naty Baaklini. She will be helping me tell a story about Vivienne and Jacqueline and their recent adventures on the contested border between Morante and Saronne. Oh, it’s going to be fun. Just can’t get a break, even when half-dead….